DiveR, Australian producer of a top line freediving fins has released fins reinforced by TeXtreme® Technology. The new fin transfers the load progressively from the heel to the toe while remaining soft yet responsive, that gives the diver a new unique feeling. TeXtreme® technology it is based on using Spread Tows instead of traditional round tows to create ultra-light weight, high-performance products. Companies utilizing the TeXtreme® Technology achieve significant results in minimizing weight while increasing rigidity, strength, etc., in comparison to other carbon fiber materials. “Ray continues “We’re given outstanding results when using TeXtreme® Technology in our fins and are continuing to work closely with the TeXtreme® team in developing materials that add both toughness and mechanical advantage to the end product”. 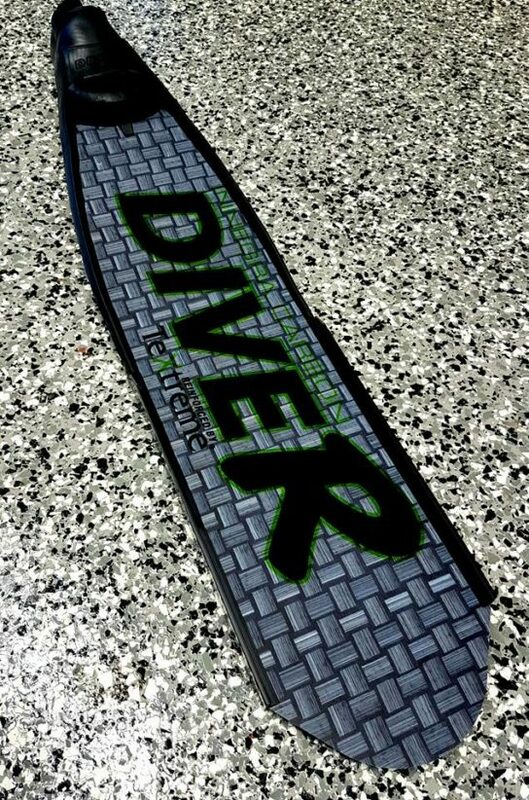 By using TeXtreme® Innegra™ hybrid fabric, DiveR was able to maximize the weight savings with the thin ply advantages of TeXtreme® Technology and combine it with the hydrophobic and ductile properties of Innegra™ to achieve the most advanced fin ever produced. TeXtreme® can be found in Formula 1, America’s Cup, NASCAR and Le Mans racing, bicycles, golf clubs, surfboards, tennis racquets, table tennis blades, rowing shells, skis, snowboards and ice hockey sticks as well as various industrial and advanced aerospace applications. Owner and manufacturer of DiveR fins Ray Powell started to produce freediving fins in the year 2000. Quote RAY ” my dream was to produce the best fin on the planet in both performance and aesthetics.” This is still the driving force behind DiveR today. Now revered as the bench mark for freediving fins the world over DiveR is continuing to pursue excellence in the field of composite fabrication.